1 Pair Under 300 lbs. 2 Pair 300 to 500 lbs. *Motorcycles over 500 lbs should be secured front and rear. ATVs must be secured with a minimum of 2 pair of tiedowns. Always chock the front wheel. Attach to the handlebar or frame where the tiedown will not slip off. The area of the truck or trailer where the tidown is hooked must be of sufficient strength. Protect the strap webbing from sharp edges, hot surfaces and acids. DO NOT use if webbing is frayed. Tiedowns are not to be used as personal restraints or for towing vehicles. Place the tiedowns as shown. On a motorcycle tighten until the fork springs are approximately 50% depressed. 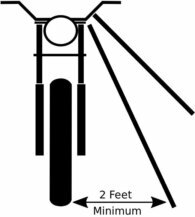 A rear tiedown may not be necessary on a lighter bike but should always be used on larger motorcycles and atvs to prevent shifting during a sudden stop. Place the hooks so the tail hangs downward. It is easier to tighten pulling downward than upward. Use a half hitch to tie the loose tail below the buckle. This helps avoid wear of the strap as it lashes in the wind. Release the ratchet by pulling the release tab up and open the ratchet to a flat position. Pull all the webbing from the drum. Lift the tab and position the ratchet in the closed position. Work the handle approximately 5-6 clicks. This will position the drum opening slots parallel with the ratchet body when the ratchet is closed. In this position the webbing will almost completely cover the spool. Only a very small part of the back half of the spool will show at the bottom edge. This ratchet position will allow you to properly use the tiedown. Now place the tiedown on your motorcycle, ATV, etc. with both top and bottom hook in place. Pull the webbing through the ratchet split drum until it is very tight (it will not loosen if the drum position is as described). Work the ratchet to tighten as necessary for good security. What is the difference between cam buckle and ratchet tie downs? Cam buckle tie downs use grip and tension to hold the strap under a toothed bar. A ratchet is just that, a ratchet that tightens the strap around a central bar. Both are easy to use and both hold very well. When and why should you use a ratcheting tie down versus a cam buckle tie down. Cam buckles are easier to use. The strap is tightened by grabbing the loose tail and pulling down on it. To loosen press the release at the back of the buckle. To tighten a ratchet pull the tail down snug and then use the ratchet arm to ratchet the tie down tight. Loosen by pulling the release in the ratchet handle and opening the ratchet all the way. Cam buckles are rated at 1800 lbs and ratchets are rated at 3000 lbs for a 1″ tiedown. So if maximum strength is needed choose the ratchet. Cam buckles use grip and tension to tighten and hold the strap. On rough roads this can have a tendency to loosen over time. It is always a good idea check the tension on all tiedowns at every stop whether using ratchets or cam buckles. If traveling over rough roads it is a good idea to stop and check frequently. The other main difference between the two is how tight the strap can be tightened. Due to the ratcheting action a ratchet can be pulled down much tighter. If tying down more delicate or more easily crushed items such as a kayak or canoe a ratchet can be easily over tensioned. In this case a cam buckle is a better option. If tieing down a heavy load that can shift a ratchet is the better choice.